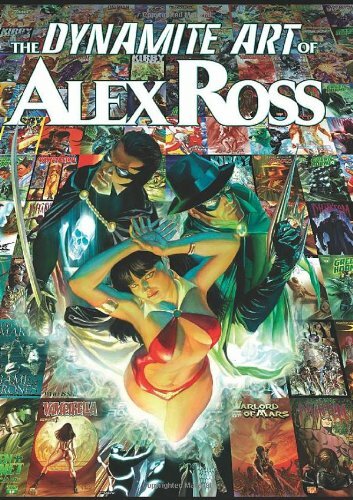 Alex Ross' third art book has as much impact as Mythology and Rough Justice. However, it's a little different from those two books. It features art for the lesser known superheroes (to me) from Dynamite. Most of the characters are new to me, like those from Project Superpowers, Kirby: Genesis. There's also The Torch, Bionic Man, Green Hornet, Flash Gordon Zeitgeist, The Shadow and even Voltron (yes, that Voltron). There are sketches, designs, layouts, pencils, panels and plenty of covers. Having gotten used to seeing DC superheroes like Superman and Batman from Alex Ross, I wasn't expecting a whole new cast of characters in the book. The art for Kirby: Genesis is quite radical with the wild costumes and unfamiliar colour palette. The bulk of the book features completely new art so there's no duplication with the earlier art books. This one's a 328-page hardcover. Many illustrations come with short commentary from Alex Ross. The art is fantastic, very typical of Alex Ross' style of realism and lighting. This is another impressive art book for those who can't get enough of Alex Ross. Wait, so it includes art hes done for marvel also? Not really, mostly for Dynamite. Oh wow! Looks good. Thanks for reviewing this Parka. I was wondering if anyone can recommend John Romita Jr's new art book? I'm a huge Romita Jr fan so I bought it when it came out. It's a good book, but I have to say at $50 I was quite a bit letdown. It's basically a 'career overview' in chronological order divided in chapters for each Marvel series he's worked on. Seeing as I own almost everything JRJr has ever done, there is not much at all here that I haven't seen before. There is a fairly equal mix of covers and interior art. With 30 years in comics that is a LOT to pick from, and I personally would have made some very different choices in places. The best part was the "Black and White Art Gallery" section (which is unfortunately only a measly 26 pages) showing various penciled and/or inked pages, covers and sketches. Love that stuff but there's not nearly enough of it. It showcases both John Romita Sr and Jr' s careers in comics, featuring great informative lenghty interviews with both men, and has plenty of cool art from a lot of everything they've worked on, which is especially interesting in the case of John Sr, since he's had many years as an illustrator both in and out of comics before getting famous doing superheroes. This one is basically one long interview about John Jr's career, talking about just about everything he's done, with tons of awesome black and white art, ranging from sketches, pencils, inked pages, pinups and whatnot. The last page is a Batman & Hellboy penciled pinup!! (I don't care how, I want this comic to happen SO BAD!!!) I have no hesitation saying that it's my favorite one of the three books! Alex Ross is great no argument there, and it looks like a nice book, but there's just too much stuff I don't really care about in there, no matter how shiny cool it is. I still have to buy the Rough Justice book, that one looks just amazing!